There are an estimated one trillion different species of bacteria living across the planet. Scientists are just beginning to understand the level of diversity and role these bacteria play in the environment. The Earth Microbiome Project is an effort to collect samples of bacteria from different locations to create a microbial map of the world. 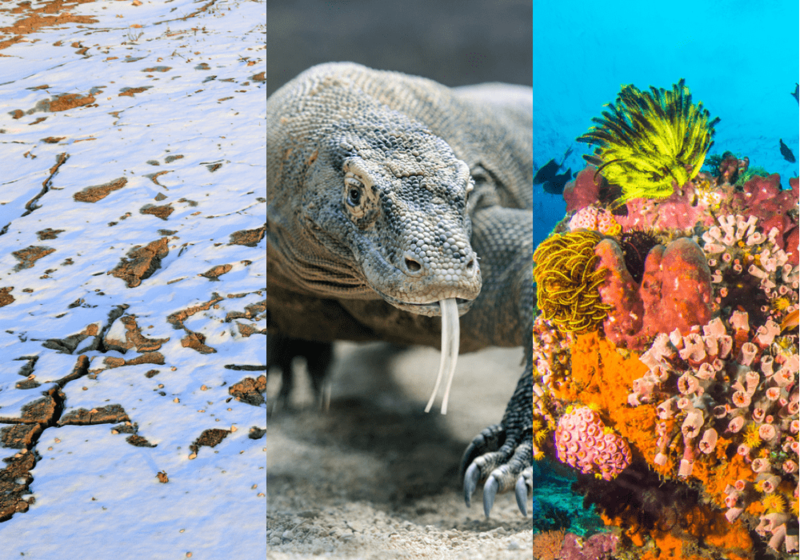 The team of scientists analyzed the first 27,000 samples, which included bacteria collected from permafrost, Komodo dragons, and coral reefs. Biologist Rob Knight and Jack Gilbert, two of the co-founders of the Earth Microbiome Project, discuss what patterns they found in the data and what they tells us about life on Earth on the microbial scale. Jack Gilbert is a group leader for microbial ecology at the Argonne National Laboratory. He’s also a professor of surgery at the University of Chicago. He’s based in Chicago, Illinois. Rob Knight is a faculty director of the Center for Microbiome Innovation. He’s also a professor of pediatrics and computer science & engineering at the University of California, San Diego. He’s based in San Diego, California. IRA FLATOW: This is Science Friday. I’m Ira Flatow, continuing our talk about the microbiome. If you took a flight around the world, and you looked out your window, you’d see all types of landscapes. There’s flowing oceans and frozen tundra. You have open savannas– you name it. Now, if you got even closer, you’d see all of the diverse plants and animals that live in those ecosystems. But what if you could get all the way down to the microscopic level? What does the world look like on a bacterial level? What types of microbes are living in those ecosystems? Do they vary from place to place? Well, my next guests are part of a team working to make a microbial map of the world, one swab at a time. They analyzed 27,000 samples from around the world. Of course, it’s called the Earth Microbiome Project, and the results were published this week in the journal Nature. And they’re here to tell us what they found. Let’s talk to Rob Knight, professor and faculty director for the Center for Microbiome Innovation at the University of California in San Diego. Welcome to Science Friday. IRA FLATOW: I also want to bring on Jack Gilbert, group leader for microbial ecology at the Argonne National Laboratory in Chicago. Welcome, Jack, to Science Friday. JACK GILBERT: My pleasure to be here, Ira. IRA FLATOW: Let me ask you, Jack, collecting the microbiome of the entire world– people must have thought you were crazy. This is a big undertaking! JACK GILBERT: Yeah, it is crazy, right? It’s not something a normal scientist might say– yeah, I’m going to wake up one day and sequence everything. So yeah, we got a lot of kickback from people saying, hey, we don’t think this is technically possible, or it’s an unachievable goal. And bear in mind, we haven’t quite finished yet by any stretch of the imagination. So maybe it is unachievable. But we’re at least trying to tackle it, and that’s what’s important. IRA FLATOW: You made that first step. And Bob Knight, the first phase of the study had 27,000 samples. How did you pull that off? How do you collect these samples? Are you down on the ground with a little q-tip or something? ROB KNIGHT: Yeah, well, we had a lot of help. And what was amazing about this project is we had literally hundreds of researchers from around the world send us sets of samples that answered an interesting spatial, or temporal, or evolutionary question. And then out of all those individual projects, we were able to start assembling this map to capture all of its microbes. IRA FLATOW: Jack, give us an idea of, as an example, the places that these samples came from. JACK GILBERT: Well, you can imagine any place. Where did your kids stick their fingers? In any place you can possibly imagine, right? That’s exactly what Rob and myself and the 400 other collaborators have done. We’ve gone into hospitals and homes. We’ve gone into the soils of Antarctica, into the sediments underneath the ocean, even into the International Space Station. So we figure that’s within the gravitational influence of Earth, so it’s fine. So literally any environment you can possibly think, we covered. But we’ve currently gone a little bit beyond our 27,000 samples. We’re now up to around 50,000, 55,000 samples and continuing. So this project is just starting. It’s been going for seven years, and we’ve just started. So we have ambitions that probably outstrip what we can possibly do, but we’re working towards it. IRA FLATOW: Our number– 844-724-8255. 844-724-8255. Do you have a target number of samples you’re looking at? JACK GILBERT: Yeah we started around 200,000. With around 200,000, we can get a reasonable adequate coverage of what we think to be the diversity of the planet. But what’s interesting about the study is it’s actually given us estimates of the total microbial diversity of our planet around a trillion bacterial species. And so we might have to upscale that 200,000 sample estimate higher. IRA FLATOW: Wow. Do you sample all the viruses and the fungi that go along with them? ROB KNIGHT: Not in this phase of the project, although that’s exactly what we’re doing in the next phase, where we’re using a new technique called shotgun metagenomics as well as metabolomics to be able to get all the fungi, all the viruses, all the other DNA that’s in each of the samples. As well as all the metabolites, so all the chemical functions that are present in there as well. IRA FLATOW: There’s got to be a spot that you haven’t been able to get to that you’re really interested in. ROB KNIGHT: Well, we’d love to get to Mars. IRA FLATOW: Buy a ticket! JACK GILBERT: Yeah, and what’s interesting about this study is we had to go through some ethical regulation to get the samples from different parts of the world, to work with collaborators in different areas. So we haven’t been able to get good samples from India or from Brazil due to the biodiversity regulation laws. So they’ve actually set up their own satellite projects to tackle that. But we would like very much to have better integration with a number of different countries who have environments that are quite unique, i.e., not found anywhere else in the world, such as a unique type of hot spring, or unique elevation levels. So there are interesting spaces to go. IRA FLATOW: Yeah, thank you. I’m having a senior moment thinking of that name. You’ve gotten samples from there, too? JACK GILBERT: Absolutely yeah. We have samples from actually within the vent plumes and from the towers that make up the vents. So working with researchers at the Woods Hole Oceanographic Institute and also researchers down in Australia and in China, we’ve been able to get samples from that space that have allowed us to categorize, or at least put them in the context of the rest of the microbial diversity of the planet. IRA FLATOW: Now, Rob, I understand that there was a large spongy study that– sponges that used your database. What did they find there? ROB KNIGHT: Absolutely. So the Sponge Microbiome Project was an important part of the Earth Microbiome Project, just like the parallel projects on corals, on birds, and on a number of other interesting taxa. So what they were able to do– previous studies on sponges had used different methods in different locations and in different species. What we were able to do was provide one overarching picture that showed what drives diversity of the microbes in sponges in terms of the depth of the water, the geographic location, and also the species-specific signatures– about how particular microbes can only associate with particular sponges. And the same kinds of principles are going to be useful pretty much anywhere else in the animal kingdom, including things like trying to understand how particular microbes attach to particular tumors like you were talking about just before on the show. IRA FLATOW: Yeah. And Jack, I understand that scientists are using the database in a current study of the microbiome of the komodo dragon? JACK GILBERT: Yeah, we’ve gone into all kinds of animals, and it really depends on what we can access. But what’s most impressive about the study is it’s less the kind of environments we’ve gone into, and more it’s a capacity to educate us about where microbes are found. Think of it as like the ultimate field guide to bacteria. We even have trading cards for certain types of bacteria, certain unique sequences which tell us that that organism exists here, and it’s found in all of these different environments. And we found that some microbes are really, really well-distributed across the Earth, which changes our perspective. We used to think everything adapted very well to unique environments, but some things, at least at certain levels, have really wide distribution. So you find microbes in the soil that are also found in the ocean. It’s quite remarkable. IRA FLATOW: So have you found unique bacteria that no one has seen before? JACK GILBERT: Yeah. Rob, you want to talk about the particular types? IRA FLATOW: Are there unique ones that no one has seen before that you’re discovering? ROB KNIGHT: Yeah, there’s many unique ones that have never been seen before in the database. But because they’re unique, we don’t know what they are just from the little sequence signature we have. So it’s kind of like we’ve read their name tag, but their name tag’s in a language we don’t understand yet. It’s like you have, say, a bunch of name tags in Chinese. And to understand them, you’re going to have to immerse yourself in that language and that culture a lot more. So this is what we need to expand to the rest of the genomes and to be able to put them in context. IRA FLATOW: And in a study that came out this week, Rob, you took a macro approach to the data by sequencing the genomes of these bacteria. Now, that’s a lot of information. How do you use it to compare the bacteria? ROB KNIGHT: Absolutely. Well, so going from the sequences we look at in the Earth Microbiome Project, that’s usually a couple of hundred bases. And the whole genome is a couple of million bases. So that’s a dramatic expansion in the data. What we do when we’re looking at the whole genome level is we can either build phylogenies out of single genes and then stick them together, or we can stick all the genes together and then build a phylogeny. And both of those approaches have their strengths and weaknesses. Essentially, though, it’s getting to where you can use the whole genome to precisely position every organism on the tree using all the information that you’re going to get about it. So really realizing Darwin’s vision of the tree of life that connects everything. IRA FLATOW: So are any patterns, then, emerging? ROB KNIGHT: Well, one of the patterns in the Earth Microbiome Project that we see really clearly is just how weird we are as a habitat for microbes, so many of the most dissimilar environments from anything you’ll see in the environment, from the soils, to the oceans, to the water. The microbes in your gut, and in your mouth, and on your skin are totally different from any of those locations. And so one thing we’re trying to understand at the moment is why are animals such weird habitats from the microbial perspective. IRA FLATOW: Wow. Yeah, we’ve been following this for years. And we keep hearing incredible things about how the microbes move around, and we’re leaving them behind as we leave the seats that we’re sitting in, and all kinds of stuff. Let’s go to Gill in Gainesville. Hi, Gill. Welcome to Science Friday. Gill: Hi, question. Do viruses get infected by bacteria, or vice versa? Are they in competition? ROB KNIGHT: Bacteria get infected by viruses. As far as I know, the reverse is never true. JACK GILBERT: Absolutely. So yeah, bacteria have a mechanism to basically chop up the DNA of the viruses that infect them. And so now we can hijack that system to do very accurate editing of genomes, from everything from humans, to elephants, to bacteria in general. So they’re using that system very effectively. IRA FLATOW: Let’s go to Hotchkiss, Colorado. Wink. Hi, welcome to Science Friday. WINK: Hi, Ira. I’m an environmental, or rather, a organic farmer in Western Colorado. And my understanding is that the microbes in my soil are constantly changing to adapt to changing environmental conditions, including their food source and whatnot. And so I’m wondering if it’s realistic to envision a finite number of microbes in the environment, or are they constantly changing? JACK GILBERT: This is a really interesting point. They are absolutely adapting to their environment. So essentially, when the temperature changes, or the acidity of the soil changes, microbes will adapt. However, there are ways in which we can model how those organisms will adapt and see how they’re going to change with said changing climate, or a changing amount of rain, and see how they will actually adapt and fluctuate. But we’re also using this information to create new probiotic formulations, so probiotics for plants, almost. So we can add bacteria into the soil around the plant and actually help it to adapt even better to the changing environment around it. ROB KNIGHT: And actually, one of the specific projects in the EMP was looking at what happens when you artificially add carbon dioxide or warm the soil to see how the soil microbes respond in response to climate change. IRA FLATOW: And did you find any results? ROB KNIGHT: Yeah, so there were a whole lot of specific changes where the diversity of the soil microbes was lower under those conditions. And having those experiments out in the field are really, really useful for ground truthing those global climate models and understanding how bacteria both consume and produce greenhouse gases like methane and CO2. IRA FLATOW: We’ve talked about the microbiome in the soil. We’re very interested in the microbiome everywhere. And we’ve heard people tell us that plowing the soil greatly disrupts the microbiome. Have you found that at all? JACK GILBERT: Yeah, absolutely. So when you disrupt the organic matrix of the soil, you actually break apart some of the relationships between certain bacteria. And with part of the Earth Microbiome Project, we had a study focused on this in rural plots in African subsistence farmers. And the microbial organisms that are associated with those organic plots can be heavily disrupted in terms of their activity, which changes the fertility of the soil. The soil becomes less able to support the crops when we disrupt those patterns. IRA FLATOW: This is Science Friday from PRI, Public Radio International. I’m Ira Flatow, talking with Jack Gilbert and Rob Knight, who are studying the microbiome all over the world. How much of the world have you have you guys covered so far? JACK GILBERT: A fraction of a percent. [LAUGHING] However, in terms of the total diversity, we’ve been able to map and plot. We think we’ve covered a lot of the phylogenetic diversity, the evolutionary diversity of the bacteria. But this is just looking at which species are there. But it should give us a real ability to understand how to engineer ecosystems to maybe be more adaptive or able to cope with change. And maybe even to seed new planets with functional ecosystems that could be effective in terraforming those places. IRA FLATOW: Do you think you could find bacteria that could survive on those planets? Let’s talk about Mars, for example. IRA FLATOW: Right, go ahead. ROB KNIGHT: Yeah, well, Mars is challenging on the surface, because you have a lot of perchlorates. So it’s very highly oxidizing. But on the subsurface, there’s conditions that are very favorable to the same kinds of microbes that we have subsurface right here on Earth. So, for example, even down on oil wells, you have a lot of microbes that act as unique signatures for different oil formations, and so on. And it’s entirely plausible that those microbes that live underground could still be around on Mars. IRA FLATOW: You want to do that, it sounds like. I hear that in your voice. ROB KNIGHT: Yeah, I think it would be cool. IRA FLATOW: It would be cool! [LAUGHING] We have to get there first. Well, we keep talking about that. When they send rovers or whatever to Mars, they say we’ve already contaminated the surface, because there are bacteria on it from people who worked on it. JACK GILBERT: Yeah, actually, it’s extremely difficult to get rid of all bacteria. You go into NASA, they’ll tell you they do as good a job as possible, but sometimes it’s not possible. However, this really feeds into our understanding of built environments in general. A part of the Earth Microbiome Project contains studies that we’ve talked about before on Science Friday, such as the Home Microbiome Project, and the Hospital Microbiome Project, which have enabled us to see just how sterile, or not so sterile, our built environment spaces are. And hence, that led to work in the International Space Station, trying to figure out which microbes the astronauts are actually leaving behind, and which microbes are contaminating, and how that’s affecting their health in that environment. IRA FLATOW: Is that a danger, you think? ROB KNIGHT: That’s probably mostly a good thing and yet another way that the International Space Station’s fostering international cooperation. JACK GILBERT: Yeah, we’re fostering international microbes and shifting them around. Remember, if you’re exposed to more microbes, it stimulates your immune system to become slightly stronger. So that’s a good thing. IRA FLATOW: People want to send you– so we’re getting listeners saying, I want to send some soil samples in. Can they do that? ROB KNIGHT: The USDA has some fairly strict rules about what you’re allowed to do with sending soil samples across state lines, so that’s not something we can do on an individual level at this point. But at the scientific community level, one thing that we’re doing is extending an invitation to the entire scientific community, where if you’ve generated DNA sequence data using the standards and protocols in the Earth Microbiome Project, we’ll set up a system where you can contribute your data as part of the next iteration of the Earth Microbiome Project. And we simply encourage the scientific community to do that right now. We’re hoping one day to be able to enable that for individuals as well. But right now, it’s more at the level of, if you have your own lab and your own DNA sequencing equipment. IRA FLATOW: Yeah, well, send it to them. Jack Gilbert, group leader for the microbial ecology, Argonne National Lab. Rob Knight, professor and faculty director at the University of California San Diego. Well, thanks for taking time to be with us today. When we come back, we’re going to talk about gobbledygook and bologna. Is that what the Supreme Court thinks of math? We’ll talk about it after this break. Stay with us. View an interactive world map of samples taken for the Earth Microbiome Project. It shows the position of each sample, connected to its most similar other sample in the EMP.